By paleoaerie in Fossils of Arkansas, Mystery Monday, Paleontology on January 26, 2015 . I found a considerable size peice like this, but has me baffled as well. I looked and looked, even checked out Yale University of Paleontology. The closest thing I found was from the Devonian era and it is called Fasolites/Fasolite. Also known as Honeycomb Coral, but my specimen has abrupt octogonal shapes as said like a honeycomb… Heres the kicker, my specimen has crystal like a small geode. The rest of the slots are filled with a Tan/Goldish yellow which very much looks like honey. 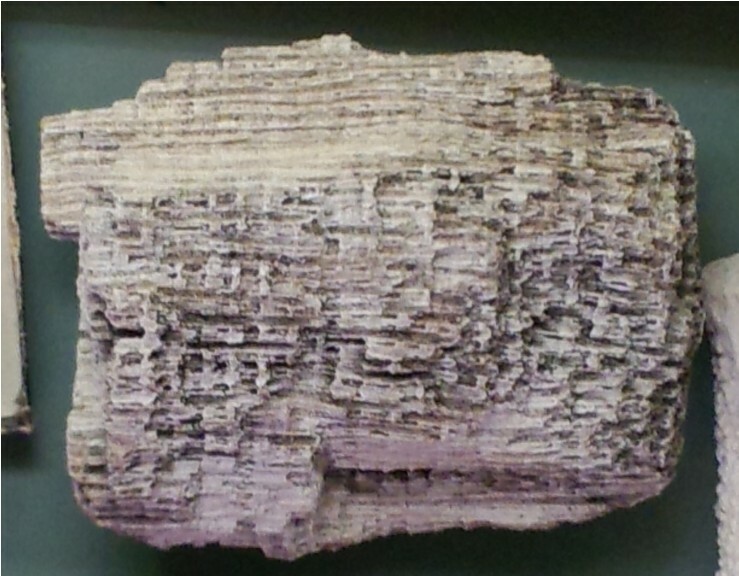 I have never seen such a thing nor have i heard of fossilized honey… Still to this day I am researching it because it might be a new species of coral or it could be what i originally thought, a fully preserved fossilized Devonian honeybee hive quarter. Let me know if I am correct. Could you send me any pictures? That would be helpful for identification. Do you know where it came from? That would also be extremely helpful. You said it has octagonal shapes, but like a honeycomb. Honeycombs have six sides, so do you mean honeycomb as in the general pattern or the number of sides for each compartment? I have seen some corals that have been warped during the fossilization process or just had a weird growth pattern that made them look possibly octagonal in some areas, but if it was consistently octagonal, that would be a new one for me (although I am not a coral specialist, so there are lots of corals I have not seen). If it is Devonian, it is highly unlikely to be a honeybee hive. The earliest known bees are from the Cretaceous, at least 250 million years after the Devonian. The first known land plants didn’t appear until the Silurian Period, so not a whole lot of time to evolve commensal relationships with insects, much less mutualistic relationships like bees do with flowers today. There were also no flowering plants until the Cretaceous Period. So my guess is some type of coral, of which there is a huge number of coral species out there, especially when you add in all the extinct groups from the Paleozoic Era. now as far as what is in them, I would have to see. It is possible the coral was filled with quartz as a result of groundwater percolating through it in the millions of years it was buried. Water that had silica and iron being deposited in the open spaces could make that color.In this case of course, it would not be the quartz people usually think of as quartz with the nice crystal points, but a microcrystalline quartz like chert.